Every purchase you make using your card, your online account and every sign in into social media accounts generate data. We do not even realize how we are contributing terabytes of data every day. The question is – where does it all go and is it usable? Firstly, let us get to know about the data we generate. 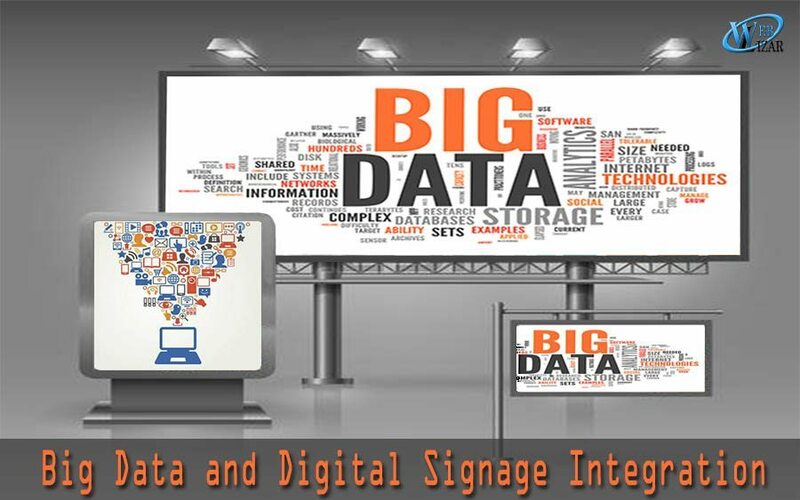 What Is Big Data’s Role In Digital Signage? The rise of big data is increasing the possibilities of using digital signage manifold. You can, not only help your customers by giving them correct and real-time information always. You can also assist them by personalizing your data target audience groups. You can, not only help your customers by giving them correct and real-time information always. You can also assist them by personalizing your data target audience groups. You can see the effect big data on the improvement of car parking services. In Brisbane Airport, Australia, the system uses the login information from fliers to booking car parks in advance, adjust car parking times and accepting online payments. Once data collection and digital signage become streamlined, you can expect a business to become more successful. For example – if you run a sports store that has many shoes from multiple brands, you can easily display specific features of your products including available sizes depending on live data from your inventory and customer sales departments. Any user who is looking for a particular product won’t have to walk through your entire store to find the model and then check for their right size. They can directly browse their available options and your collection. Online pre-booking is another advantage your customers can enjoy if you adopt a digital signage option with big data integration. This will offer a more streamlined experience, where your clients can check the availability of their desired products from home, pencil-book them and try them out at your store. Once you get their necessary details and payment details, you can log these in into your company database. This makes SMS marketing and email marketing a breeze too. Many parking lots are now using license plate recognition as a standard system for car recognition. Parking for busy spots can become a dream if your customers can pre-book their spots. Cameras can help in recognition of license plates. Comparison of stored data with new information across your company database will help you instantly calculate parking costs. You can use digital signage at check in and check out points to show your customers their booking details, in and out times and pricing. Digital signage in combination with big data helps in customer communication. You will be able to understand what your client needs and efficiently deliver it to them. A two-way interactive system is beneficial in these situations. For example – a couple of Pizza Hut restaurants are now using digital restaurant menu board and mobile casting technologies to take orders. Customers can customize their pizzas, get suggestions about complementary drinks and fries, place the order and complete they payment right from their tables. They don’t have to stand in queues to place their orders. You can, not only change the theme of your ads according to the seasons, but you can also display current offers. You can pick specific offers for specific target groups. For example – if you have a retail outlet, you can post a variety of offers across your floor(s) depending on the section. You can customize your offers for women, men, and kids depending on the location of your digital signboard. Usually, most clients prefer indoor signage options for their stores, including standing (vertical) displays and LED TV-like displays. Digital signage kiosks are more standard for outdoor advertising and promotions. Many modern stores and art museums are using screen casting, mobile app pairing, Bluetooth and wireless beacons to collect consumer data. Your system can identify an old customer from their app profile and register new clients in the same way. Your CMS software will get a complete look at the client’s buying profile, purchasing power, and relevant products. This will help you offer the most lucrative bargains for that customer. This works both online and offline. The massive amounts of big data in your database, will help your system profile a possible customer in real-time and suggest most likable products and offers. This takes the popular loyalty programs to a whole new level. WordPress may be enough to manage your display content; it is not enough to manage big data. You will be dealing with sensitive customer information including their credit card details and bank details. You will need a reliable RDBMS and could storage system. This cloud storage needs to be compatible with whichever CMS system you use for your digital displays. Narrowcasting becomes a lot easier with reliable cloud storage that promises consumer security. Also, try looking for a hosting service that is private. A shared hosting will be economical, but the speed will not be sufficient for updating content on the move. A huge advantage of going all-digital is flexibility and small execution time. You can personalize offers for your customers on the fly. Changing content on your management system like WordPress and casting it on the big screen will not even take you minutes. Forget technicians and electricians; all you will need is an access device and a reliable network connection. If you have a mobile and a Wi-Fi, it will be enough to modify your content and display. A few clicks and you will be ready to flaunt an entirely new look. Digital signage can be both a source and a display for big data. Interactive displays, the kind we see in parking booking, ticket booking and food ordering services, serve as reliable sources of big data. Cloud storage keeps this big data safe, and a strong RDBMS helps in data organization and usage. Depending on your customer demands, you can use the big data from the source to display product or customer information. We hope that you have enjoyed this blog by Trudy Seeger. Just to keep it interesting, we have some tips on How To Use Instagram To Promote Your Business and Top Ways To Make Website More Secured. Author Bio: Trudy Seeger is a marketing strategist. He has been working in retail marketing for the last 5 years. He has experience in all forms of customer-oriented digital displays including restaurant menu board, parking spot booking, retail offers, and services.